Irving Silverman stands in front of the nonoperational lighthouse his wife built for him before she died in Bernard recently. In her memory, Silverman performed weddings as a notary public for years, marrying 34 couples. Now that Silverman is 92 years old and can no longer live alone in Maine full-time, his notary license cannot be renewed. BERNARD, Maine — Irving Silverman will never marry again. That’s his vow. After almost a decade of bringing couples into his lighthouse and joining them in marriage, Silverman has been forced to call it quits. At 92 years old, Silverman had to leave Maine, where he lived for the last 40 years, to move to a retirement home in Massachusetts — closer to family. By moving, he was no longer compliant with Maine’s laws about notary publics, who must be full-time residents. He applied for an exception, but didn’t get one. “I could perform weddings in Massachusetts, but I won’t. This building has the spirit of my two wives. Massachusetts doesn’t have that, so I won’t marry people there,” he said. For Silverman, it’s the lighthouse that made the 34 weddings he performed special. When his first wife died in 1956 his heart was broken and he never thought he would marry again. But he was wrong. With two young children at home, he found it difficult to be a single parent, so he started attending single-parent meetings. Because he was blind, he couldn’t drive to the meetings, so he asked a woman named Nancy to drive him. Nancy was a single mom. Nancy persisted. “Not if, but when will you marry me?” she asked. The two were living in New York at the time. It was Nancy who introduced him to Maine, and, when he told her he wanted a boat, but couldn’t have one because of his blindness, Nancy said she would build him a sort of vertical boat — a lighthouse. “She designed this building. She had it built. She gave it to me as a gift,” Silverman said, sitting in his octagonal [lanternless] lantern room, which overlooks dozens of lobster boats in Bass Harbor. Silverman smiles when he talks about Nancy and their love and their lives together. Performing weddings at their special place was a way for him to remember her and to sort of pay the world back for making him so lucky. Silverman’s notary public license expired last summer. 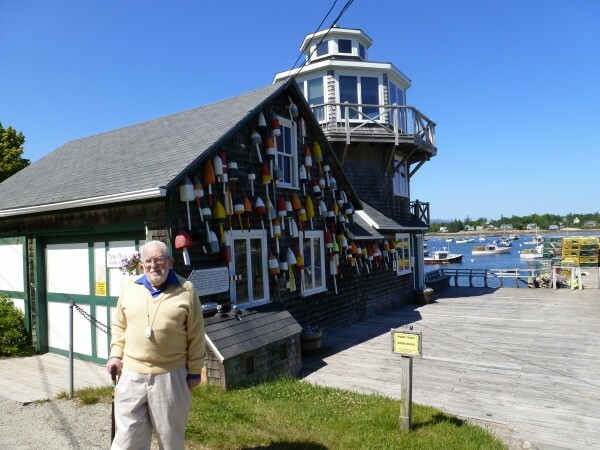 He will only spend two months in Maine this year before heading back to his retirement home. When he walks up the three flights of lighthouse stairs in his orthopedic shoes, there seems to be some pain. His two hearing aids squeal sometimes and he wears an emergency button around his neck in case anything, such as a fall, should happen. He’s beginning to feel his age, he said. But he has hope. He’s going to leave the lighthouse and homestead to his children and he hopes one of them will carry on his tradition and get licensed as a notary public in Maine so they can officiate weddings. Meanwhile, Silverman plans to go back to Massachusetts and write a book about longevity.